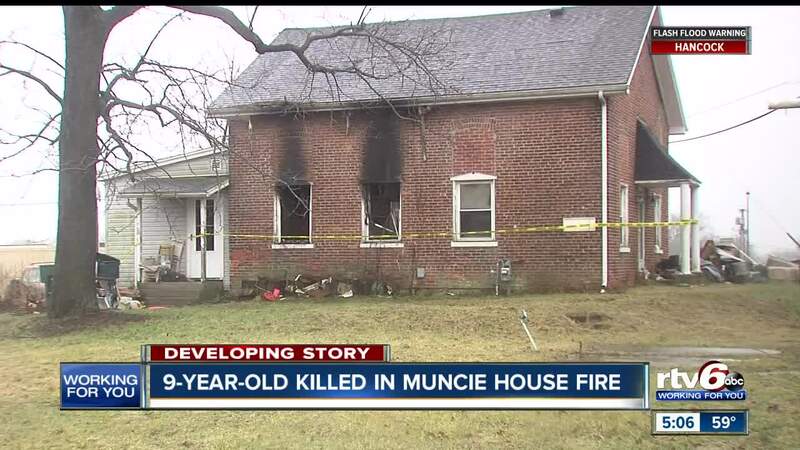 In Muncie, an overnight fire has claimed the life of a 9-year-old boy. MUNCIE — A nine-year-old Muncie boy who was alone when fire broke out at his home is dead. Firefighters got the call to the home at the corner of 29th and Walnut at 3:45am., Thursday. "Unfortunately, the house held a lot of heat. It's a brick home. It's an older building. The fire went quite some time before it was noticed," said Chief Eddie Bell. The victim was identified as Vincent Gibbons. At the time of the fire, his father was at work and his mother had gone to another home to do laundry. Police say she was drowsy after working all day and fell asleep. "As far as the charges go, there is not anything evidence wise anbody we've talked to that lead us to believe they were bad parents in any way. The kid was well taken care of from everything we can discover," said Muncie Police Detective Dustin Lee. Neighbors were saddened by what happened. "No one wants to see a little child die like that. It's a tragedy. I guess we all will have to learn from it. I hope they do too. It might have been able to have been prevented," said Michael Mccammon. The Muncie Police Department will review the case and work with the Delaware County Prosecutor as the investigation continues.